Just the three goals and one assist for the Brazilian against Las Palmas. 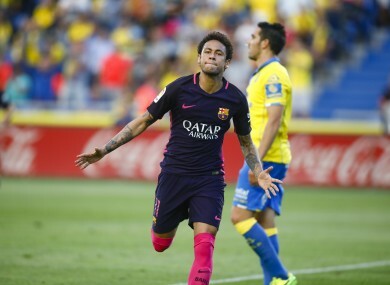 NEYMAR MARKED A personal best in a match-winning performance against Las Palmas, as he recorded his first-ever Barcelona hat-trick away from Camp Nou. The Brazilian was lethal in front of goal on Sunday, scoring three times with a host of fine finishes to help the Catalans to a 4-1 victory in Gran Canaria. He also chipped in with a pinpoint assist to set up Luis Suarez, as Barca kept their Liga hopes alive. But it was his goalscoring exploits that caught the eye, and in scoring three he marked his best-ever away game in Barca colours. Prior to Sunday, Neymar had never managed to score a hat-trick on the road in any competition for Barca, a run he put to bed against Las Palmas. It was also just the second hat-trick scored by a Barcelona player in this Liga season; the first was netted by Luis Suarez way back on the first weekend in a 6-2 thrashing of Betis. In total the junior member of the MSN has racked up 19 goals and 19 assists in his 43 appearances over the course of 2016-17, a record that puts him among the elite of the world’s striking talent. Email “Neymar was in absolutely inspired form today as Barca eased to victory in La Liga ”. Feedback on “Neymar was in absolutely inspired form today as Barca eased to victory in La Liga ”.